Overlooking 400 acres of natural countryside just south of Atlanta, Ga., a non-profit passion project of multi-platinum, Grammy Award-winning artist Zac Brown, of Zac Brown Band, is situated. A dream of his ever since he attended camp in the North Georgia mountains, Camp Southern Ground is becoming a reality as it opened this summer for the first time for week-long, overnight camps. Getting to this point has been no small feat for Brown, who purchased the land in 2011. Now, as he looks out, he sees a growing landscape of LEED-certified, state-of-the-art structures built to outlast him and the rest of us. The camp strives to bring together typically developing children, children with Autism Spectrum Disorder, those with learning or attention issues like ADHD and Dyslexia, those with social or emotional challenges, and those with family members serving in the military. On this campus, children from different aspects of life will learn and grow together in a uniquely inclusive environment. Working with architecture firm Perkins + Will, Brown and his camp team set out to design a landscape that would last 100 years. Working with the very best companies and building with sustainable materials is standard on the campus, which now has three completed structures, including the heart of the camp—the Peterson Dining Hall. All buildings on the property are designed with flexibility and giving back in mind. At the dining hall, campers learn about eating farm-to-table and back-to-farm as they compost their leftovers to feed the 15-acre organic farm they picked from earlier that day. Tucked back in the lush forest of the property sits the Space Crab treehouse, a truly unique place high in the trees, designed by Brown and Pete Nelson of Animal Planet’s Treehouse Masters. Finished in 2016, the treehouse is an escape for the older-camper population looking for a quiet place to get away and the perfect place for the camp to host advisory workshops with thought leaders from around the country to guide the camp’s development in all of its key focus areas. The Space Crab is also being utilized as a revenue generator for the camp, and has hosted companies like Mercedes-Benz and Chick fil-A for executive strategy meetings and team building. Sustainability has always been at the core of growing the campus. “Buildings to outlast us all” is a staple phrase in any talk Brown gives about the camp. This is not your average camp in the woods; its state-of-the-art concepts and unique designs created by the design team are reflective of that. When designing the dining hall, Brown told Chris Sciarrone, Architect for Perkins + Will, that he wanted an iconic building, unlike any other as the centerpiece—a building that signals to kids upon arrival that this is a unique and special place transcending everyday experiences. 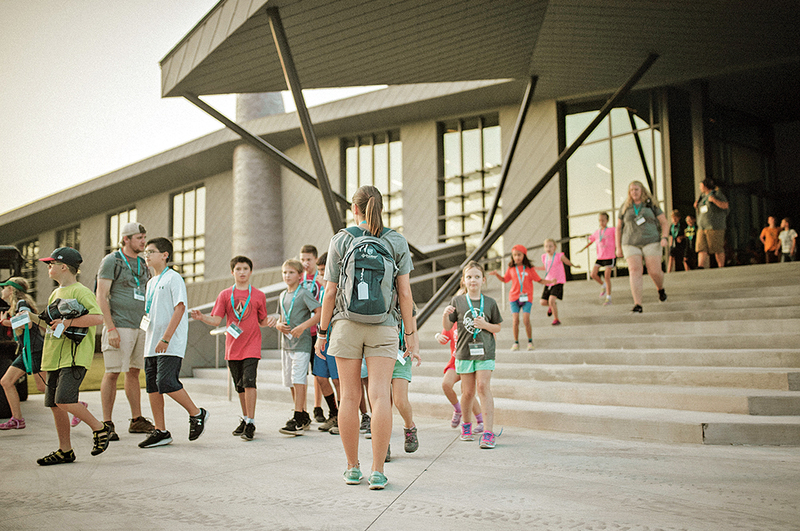 When campers arrive, making their way up the drive and around the bend, they’re greeted by the dining hall. The design team thinks of it as an open-arms gesture of welcome to those arriving at the camp. One of the most intentional designs is the Residential Lodge. During the summer-camp sessions, rooms configure to sleep 128 campers by utilizing stacked bunks hidden neatly into the wall. In the off-season, the spaces convert into 16 private rooms, which include a private bath and balcony. It will be during the off-season that the camp switches gears to focus on supporting military veterans and their families through specialized programming. The future for the camp is one focused on the growth of military programming. The camp strives to serve those who have served us. Inspired by a profound sense of patriotism, Brown is a true champion of our nation’s active duty military and veterans. For the remaining weeks of the year, the camp will provide transition support to military or veteran individuals and families, providing a place of respite with programs geared toward transitioning to civilian life, success in reuniting with the family unit, and workforce readiness. The experience in transitioning home, particularly if a soldier has dealt with combat, can be incredibly stress-inducing and disorienting. Often, veterans struggle to readjust, even more if they have experienced a life-changing injury or are suffering from post-traumatic stress disorder. This time of transition is a vital period that, if handled properly, can have a life-long effect. Camp Southern Ground is striving to create positive change in the lives of all those who walk the campus. Every day, it continues to grow—not just by the acres it covers—but by the children, families, and veterans it serves. The future of the camp is a bright one. Michael Dobbs is CEO and President of Camp Southern Ground. For more information, visit https://www.campsouthernground.org/.